Favuzzi is more than an entrepreneurial venture. 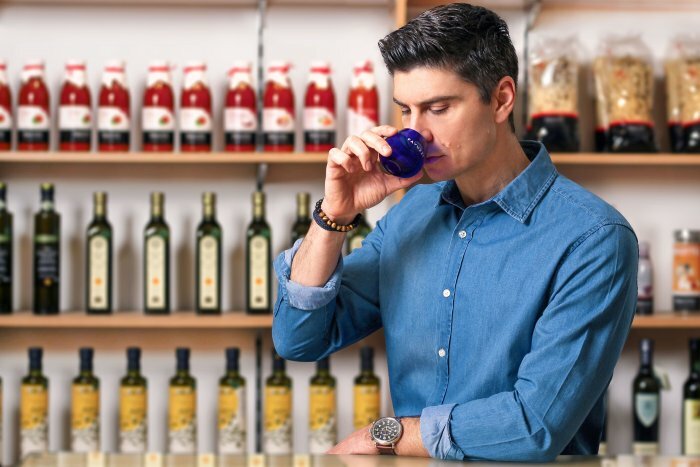 It is a new chapter in the family’s history for president and founder Michel Favuzzi, whose ancestors have earned their living from olive growing business for generations. It is only natural from a family from Puglia, Italy’s main oil producing region. Born in Montreal, far from the olive trees, Michel only becomes aware of the family tradition shortly after starting university, when a relative gets in touch to encourage him to import an oil, the Goccia di Sole, produced by a cooperative to which most of the family members still in Italy belong. For this son of immigrants, the invitation provides an unmissable opportunity to reconnect with his roots. It is the beginning of a true passion the ancient fruit that is, still today, at the heart of the Favuzzi family’s activities. The rest of the story is one many entrepreneurs can relate to: modest beginnings in the basement of the family home, crates of olive oil delivered in the trunk of an old car, a move to a first small warehouse, countless work hours, hiring a first employee and finally, Michel’s best childhood friend joining him on his adventure. Slowly, the number of customers increases, as does the product offering. While olive oils remain the company’s primary focus, hundreds of quality food products are added to its catalogue. Founded in 2000, Favuzzi has become one of Canada’s leading fine food importers. Supported by a dynamic, dedicated and creative team committed to serving specialty food retailers, Favuzzi is actively involved in enhancing the quality of food products available across Canada.